In preparation for the coming Memorial Day holiday, the marketing team here at Arcadia Publishing decided to host an employee picnic, featuring recipes from our American Palate cookbooks. We’ve brought together our favorite dishes, and asked our employees to share their best recommendations with you! 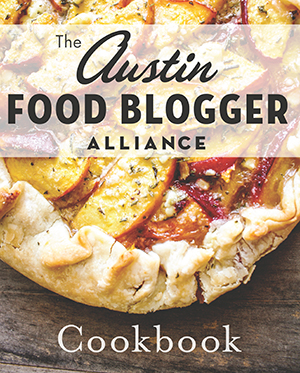 Reprinted from Austin Food Blogger Alliance Cookbook edited by Addie Broyles (pgs. 20-21, The History Press, 2013). Why did you select this dish, Katie? Quiche is my most favorite thing to eat! I thought I’d try something new with this gluten free version. Nice! So what was your favorite part about creating the dish? It was pretty tasty! Well, what did you least like about making the quiche? Crust is always pretty tricky for me, so I tried not to overwork the dough. I didn’t want it to become too heavy. I’d say you accomplished your goal. 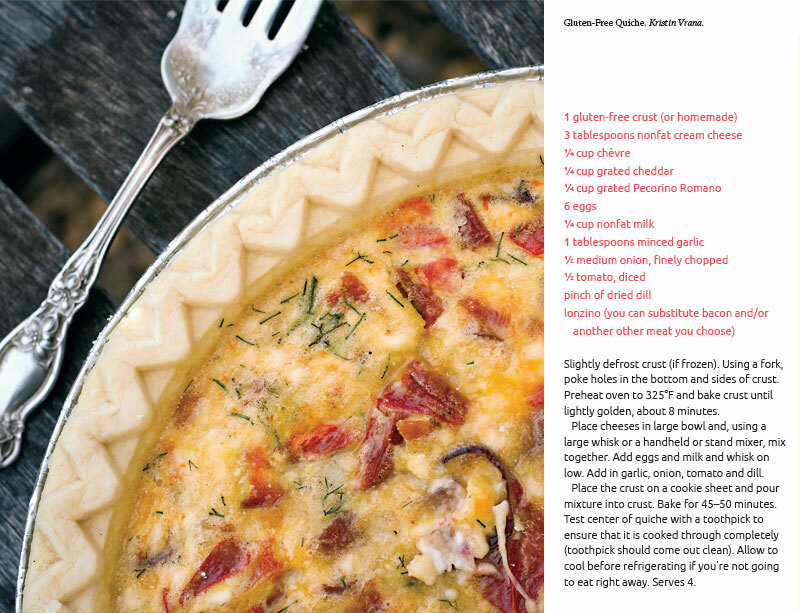 Do you have any recommendations for someone who wants to make this quiche themselves? I replaced the tomato with peppers just because I like the flavor of peppers better! 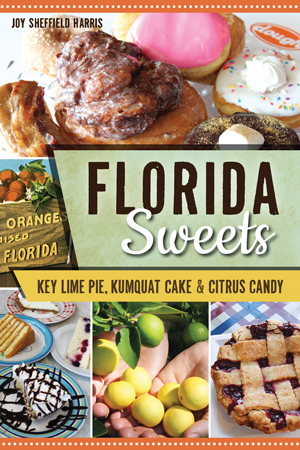 Reprinted from Florida Sweets: Key Lime Pie, Kumquat Cake & Citrus Candy by Joy Sheffield Harris (pgs. 92-92, The History Press, 2017). So what moved you to make peanut butter balls, Elysia? I’m a terrible baker, so I figured I could accomplish this “baking” recipe, since it doesn’t require any real baking. Choosing to make a dessert as a self-proclaimed “terrible baker?” That’s a bold move. So what did you least like about making this recipe, then? Trying my creation, since I really don’t care for peanut butter very much. Obviously I picked a great recipe for a diet. 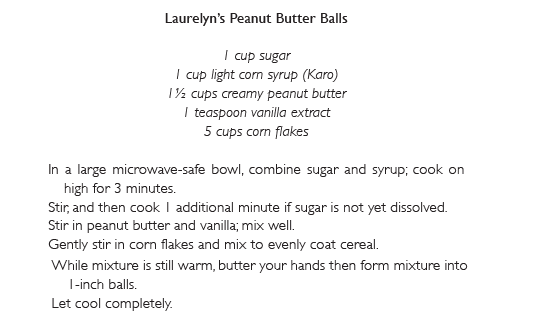 Was there anything you did enjoy about making the dessert, even if you don’t really enjoy peanut butter? It was a lot of fun doing something new and learning a new recipe, especially since I teamed up with Megan Petrie to make them! We had a great time. 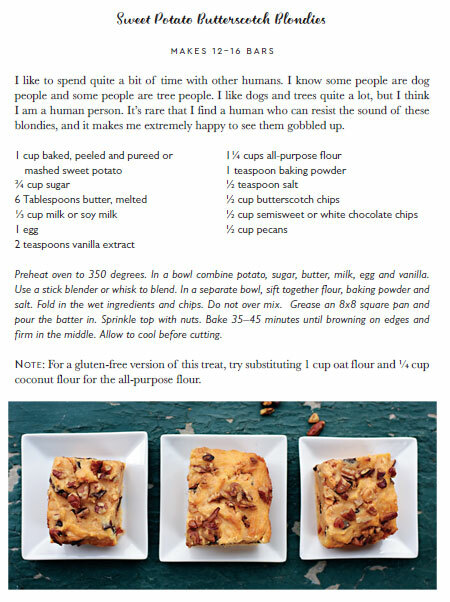 For those of us that do like peanut butter and baking, do you have any recommendations for the recipe? My bad baking skills would probably make the recipe worse, but why not throw in some chocolate chips to sweeten them! 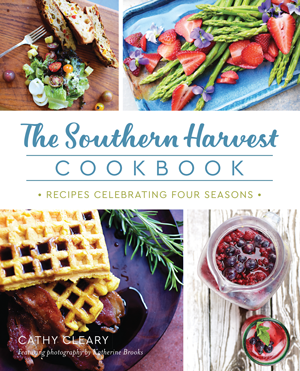 Reprinted from the Southern Harvest Cookbook: Recipes Celebrating the Four Seasons by Cathy Clearly (pg 241, The History Press, 2018). So what made you decide on the blondies, Crystal? I had recently attended a local book signing and the author had made the blondies for the signing; they were delicious! When the Potluck was announced, I thought it would be a great time to try to make them myself. It’s so cool that you got to try the author’s baking! What was your favorite part about trying out the blondies yourself? The recipe was simple and there weren’t too many ingredients. I already had most of them in my pantry! I’m a big fan of butterscotch, so this dish was perfect! It’s pretty convenient that the recipe features ingredients most people have in their kitchens already. Was there anything you didn’t like about making them? Because it was my first time making them, it did take me three tries. That was the only thing I didn’t like about the recipe, though! Good to know! Any recommendations you’d give to someone who wants to try out this dish themselves? I recommend using a ceramic dish to bake them in, otherwise be sure to give yourself another half an hour for a glass baking pan. If you’re going to double the recipe like I did, be sure to give another 40 minuts to bake. The middle will still be a little soft, but it will firm up as it cools! 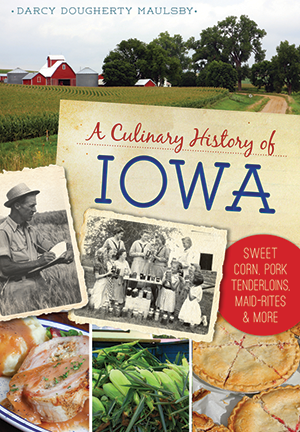 Reprinted from A Culinary History of Iowa: Sweet Corn, Pork Tenderloins, Maid-Rites & More by Darcy Dougherty Maulsby (pg. 165, The History Press, 2016). Dotti, you shared a pretty interesting reason for choosing the corn casserole recipe. What inspired you to choose this dish? 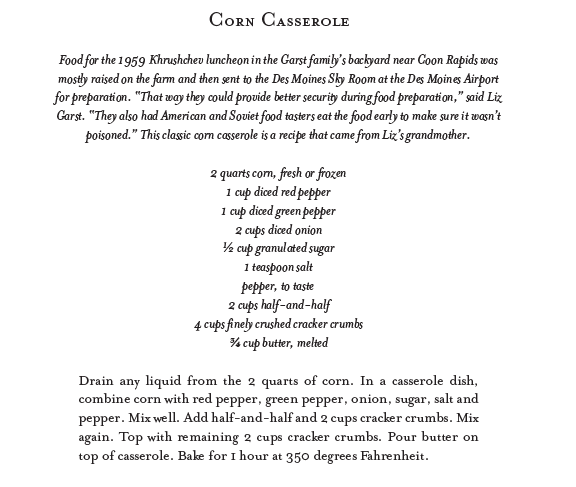 The dish was served to Nikita Khrushchev during his visit to an Iowa corn farm. I’m committed to world peace, and the gesture of an Iowa farmer offering to trade corn to feed the Russian people during the Cold War warmed my heart. It was a wonderful thing to do, to be sure. As far as the casserole went, what was the easiest part about making it? The recipe is so simple – the hardest part was just crushing the crackers in my hands. Simple, easy recipes are always great. Did you find anything about the dish difficult to make? I loved it all, so I wouldn’t say so, no. That’s great! Do you have any recommendations for the next person who tries their hand at it? The recipe calls for crackers, and all I had in my pantry were Ritz Crackers. I think they made the dish! The other recommendation I’d have is that unless you’re going to make it for a family reunion or an office recipe, you can cut the recipe in half. It made way too much with the original measurements! For more recipe ideas for Memorial Day, check out our other cookbooks! Do you have any recipes from our cookbooks that you love? Have you already tried one of the dishes we made? Let us know in the comments below!